Jing Cheng, MD, MS, PhD, Adjunct Professor, Preventive & Restorative Dental Sciences (PRDS), School of Dentistry (SOD), seeks to solve oral health disparities through statistical methodology research. Much of the biostatistician’s work is collaborative research, translating scientific efforts into clinical practice. While Cheng doesn’t directly interact with patients, she does work alongside researchers through observational studies and randomized trials pertaining to topics including: dentistry, biomedicine, infectious diseases, nursing, pharmacogenomics, and public policy research. 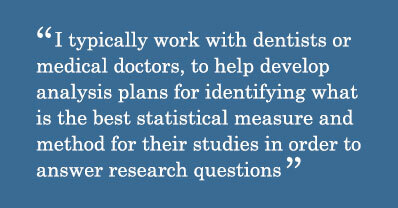 “I typically work with dentists or medical doctors, to help develop analysis plans for identifying what is the best statistical measure and method for their studies in order to answer research questions,” Cheng said. Cheng also individually researches causal inference in clinical trial applications and observational studies looking at data, understanding underlying genetic, behavioral and environmental causes and pathways of a disease, and evaluating treatment effects and mechanisms. By analyzing statistics, she is able to identify what variables or treatment components will lead to better health outcomes for people. Cheng bases all of her research endeavors on one principle: her love of helping others. In addition to helping, Cheng intends to have her career be marked by service. Cheng serves on the Academic Senate’s Committee on Research (COR). Cheng began serving on COR in 2015, after a colleague recommended it. Cheng also reviews grant proposals for National Institute of Dental and Craniofacial Research (NIDCR), a component of the National Institutes of Health (NIH), and reviews papers for up to 30 journals. The journals vary from dental, medical, or statistical journals, much like Cheng’s research varies within these same topics. In 2015, Cheng was still a fairly new faculty member at UCSF, and joining COR allowed her to meet others, contribute, and learn about the University. Through COR, Cheng also serves on a committee for the Resource Allocation Program (RAP) review which meets bi-annually to review clinical science proposals. During the 2016-2017 Academic Year, COR awarded 29 grants totaling $1,287,402 in funding. In addition, COR awarded 36 travel grants to early-career faculty. COR advises the University on matters effecting research. For instance, currently COR is participating in the development of procedures for reviewing ORUs at UCSF. Within the SOD, Cheng currently collaborates with four different faculty members. Cheng also does research for UCSF’s Center to Address Disparities in Oral Health (CAN DO), UCSF’s Clinical and Translational Science Institute (CTSI), and UCSF’s Tobacco Control Center. Through her research, Cheng collaborates with numerous UCSF faculty across both departments and schools. Currently Cheng collaborates with Benjamin Chaffee, DDS, MPH, PhD, Assistant Professor in the SOD’s Department of PRDS. Chaffee, who serves as the University Director of Global Oral Health, oversees all global health educational programs and research. Chaffee and his team are researching three projects in California and worldwide. The first project focuses on tobacco use by adolescents in a rural part of California. The second project is geared toward oral health among infants and young children in California and Brazil. The third project studies clinical adoption and therapies for dental patients. Cheng and Chaffee are working on a research project involving tobacco products, specifically how the perceived harm of tobacco products influences people’s decision to use or not use tobacco products. Cheng also collaborates with Elizabeth Mertz, PhD, MA, Associate Professor who has joint appointments in the SOD’s Department of PRDS and the School of Nursing’s Department of Social and Behavioral Sciences. Mertz has worked on topics related to: access to care, evolving professional practice models, health care regulation, supply and demand of providers, and workforce policy. Currently, Mertz is working with Cheng on a program evaluation in Oregon to see if dental clinic programs help reduce oral health disparities by comparing commercially insured children to publicly insured children. The third faculty member Cheng collaborates with is Raquel Gardner, MD, Assistant Professor in the School of Medicine’s Department of Neurology. Gardner cares for patients with neurological disorders, specializing in dementia and mild cognitive impairment. Her research focuses on traumatic brain injuries in aging populations. Her research with Cheng studies why people with traumatic brain injury have varying recovery trajectory over time (e.g., slight decliners, non-improvers, gradual improvers, and rapid improvers). By looking at severities of diseases, they analyze the impact that demographics and clinical variables have on predicting recovery trajectory over time. Finally, Cheng collaborates with Andrea Garber, PhD, Associate Professor in the School of Medicine’s Department of Pediatrics. Garber, who is a nutritionist and Registered Dietitian (RD) serves as the Chief Nutritionist for the UCSF Weight and Assessment for Teen and Child Health (“WATCH”) Program. Much of her research focuses on eating disorders and obesity. With Cheng, they are carrying out a randomized clinical trial assessing the effect of high versus low calorie refeeding in patients with eating disorders to see if their long-term recovery time is affected by a lower or higher calorie refeeding. 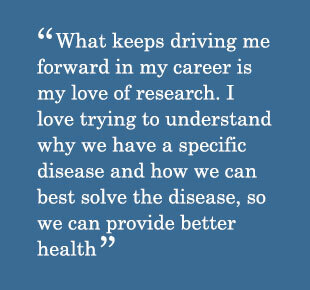 Outside of research with individual faculty members, Cheng also researches with UCSF faculty through CAN DO. The primary focus of CAN DO is to “improve the dental health of groups that have historically had worse oral health” by looking at groups of younger children and those in the low-income population. Cheng is both a member of CAN DO and a primary investigator on a dental study on mediation analysis, which develops new statistical tools to evaluate the underlying pathways/mechanisms of an intervention in caries prevention and studies why a treatment fails or succeeds to design a better strategy. Through this study, the hope is that intervention programs can become tailored to meet the needs of each person. “Our community-based intervention and research at CAN DO has exposed the need to go deep by understanding the mechanism underlying the treatment, so we can improve outcomes,” Cheng said. Cheng said one example of this practice can be seen in how they have handled tooth decay. They have found that reducing bacteria and strengthening the fluoride in the mouth together combats tooth decay. “We then try to publish our findings, whether that be on tooth decay or another study, so that future dentists are able to use our analysis methods to understand the treatment mechanism and pathways for oral health,” Cheng said. 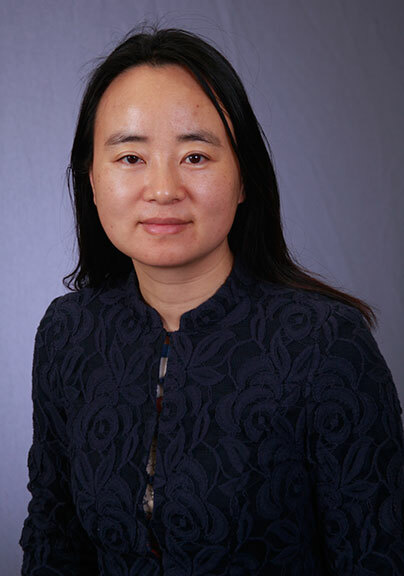 Through CAN DO and CTSI, Cheng uses her role as a statistician to help other investigators with study design, power analysis, randomization, statistical analysis, and preparing grant proposals. Cheng also conducts research for the NIDCR funded coordinating data center on different projects throughout the country. Cheng’s work there is to provide advice on study design, support for data collection, data quality monitoring, data analysis suggestions, and primary data analysis suggestions. While Cheng enjoys her research, she said time serves as a great setback in fulfilling all her research ideas. Much of Cheng’s research collaboration takes place with PRDS. The Preventive & Restorative Dental Sciences Department is the largest of the four departments that make up the SOD. This department also covers 60% of the clinical and didactic teaching. While Cheng doesn’t formally teach at UCSF, she is occasionally asked to give lectures, lead discussion groups, or give project advice. Additionally, Cheng also mentors students. This year Cheng mentored five residents on formulating their thesis and a few dental students in a summer dental research program and a global oral health program. Cheng aims to meet with mentees once a week. When she mentored the residents, she met more frequently as they got closer to submitting their thesis and communicated by email. Whether it is taking the time to ask mentees about their career path, life, and family, Cheng tries to pass on the same mentoring she has been shown. Mentoring has played a vital role in Cheng’s life and has helped her endure trials she has faced in her career. When Cheng was a student at the University of Pennsylvania, she had limited financial support, so she applied for free health insurance for her young daughter, but was rejected. Since joining UCSF, Cheng is mentored by Stuart Gansky, MS, DrPH, Professor in the SOD’s Department of PRDS, whom she said has been a source of advice, encouragement, and support. The notable biostatistician began her educational training with an impressive feat, starting medical school at 16-years-old. Born and raised in southwest China’s Sichuan Province, Cheng entered medical school during 1989, a time when China was undergoing political unrest. In 1989, the Tiananmen Square protests took place for several weeks in Beijing, where pro-democracy protesters called for Chinese Communist Party leaders to resign. On June 4, the Chinese government responded by sending troops to release fire onto the protestors, killing an estimated 300-1,000 people. Much about this event has been censored from Chinese news. Although Sichuan is over 22 hours from Beijing, the protests affected the entire country. The youngest of three children, Cheng said she grew up in a family that was very helpful and while they all still live in China, she goes back to visit them. Cheng said her parents set an example of how to work hard and care for others. Through seeing her mother continually help others, even strangers, Cheng learned to value serving, and those values fueled her passion to continue her education and to later work in higher education. Cheng graduated from West China University of Medical Sciences in 1994 with a MD in preventive medicine and began working in China. Cheng came to the U.S. in 1999, because she felt the U.S. had a reputation of excellence and freedom in higher education. After completing her MS in nutrition from Cornell in 2002, Cheng attended University of Pennsylvania and obtained her PhD in biostatistics in 2006. Then, she began teaching as an Assistant Professor in Biostatistics at the University of Florida’s College of Medicine for four years. In 2010, Cheng, her husband, and daughter moved to the Bay Area, where she accepted a position in statistics at UCSF’s School of Dentistry and her husband began working at Yahoo! Research. Their son was born a year later.